What Is OilScreenSoil (Indigo Blue)® Used For? This product was developed in response to a request for a "non Sudan IV based" instant" oil screening kit that will identify the presence of petroleum products in petroleum contaminated soil, sand and gravel. In order to provide a maximum visual contrast against dark or red soils this kit stains hydrocarbons and oils a bright royal blue color. OilScreenSoil (Indigo Blue)® tests have simple, easy to read instructions and can be used by utility or industrial contractors after a couple of minutes training. 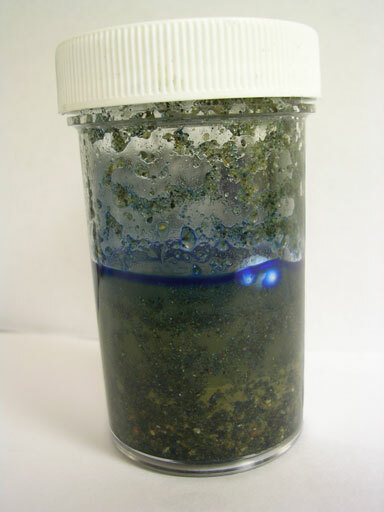 How Does The OilScreenSoil (Indigo Blue)® Test Kit Work? Suspected petroleum or DNAPL contaminated soil is added to the sample bottle, to which potable water is also added and the contents shaken vigorously. A rapidly dissolving cube is attached to the cap. The cube has a blue water soluble dye disbursed thoughout its surface. The blue dye highlights petroleum products or DNAPL by turning them a bright blue. When free petroleum floats to the surface it attaches to an EPS bead that is supplied with the kit and/or attaches to the walls of the container. From concentrations below about 2,500 ppm to the limit of detection (which is about 500 ppm) the EPS bead will turn a pale bluish shade. At very low concentrations we suggest using an used kit as a comparison for the colour depth of the EPS bead as the color change may be slight. The range of detection is approximate because a soil's affinity for oil will vary. Since DNAPL is heavier than water it is typically seen towards the bottom of the jar. The DNAPL can also be seen as blue "beading" on the sides of the container. During the excavation of contaminated soil, the OilScreen soil test kit will permit rapid assessment of the depth and direction of contaminants, thus reducing the time and costs typically associated with field screening methodology. NOTE: Esters (detergents) are the only �known� substance to interfere with the dye�s ability to stain petroleum hydrocarbon products. This may be applicable when screening for Ester based (i.e. synthetic) motor oils. Forestry, environmental, aerospace, shipping/marine, railways, manufacturing, petrochemical, utilities, construction and other companies involved with oil leak detection and site remediation. Interested In Trying These Products?